What Is a Goiter? What Causes Goiters? Goiters can be any one of several types of growths in the thyroid gland, located at the base of the front side of the neck just below the Adam's apple. In the case of Graves' disease, the entire thyroid gland becomes enlarged. 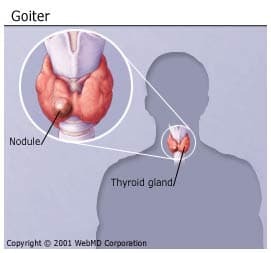 Another type, called toxic nodular goiter, results when one or more nodules, or adenomas, develop in the thyroid and trigger excess production of thyroid hormone. In short, a goiter is any enlargement of the thyroid gland. A goiter may be a temporary problem that will remedy itself over time without medical intervention, or a symptom of another, possibly severe, thyroid condition that requires medical attention. Goiters can occur when the thyroid gland produces either too much thyroid hormone (hyperthyroidism) or not enough (hypothyroidism). Much more rarely, the problem may arise when the pituitary gland stimulates thyroid growth to boost production of the hormone. Enlargement could also occur with normal production of thyroid hormone, such as a nontoxic multinodular gland. Another type of thyroid growth, called a sporadic goiter, can form if your diet includes too many goiter-promoting foods, such as soybeans, rutabagas, cabbage, peaches, peanuts, and spinach. Keep in mind you would have to eat huge amounts of these foods to cause a goiter. These foods can suppress the manufacture of thyroid hormone by interfering with your thyroid's ability to process iodide. Historically, the most common cause used to be a lack of iodide in the diet, however in the 1920s iodized salt was introduced in the U.S. now making this a rare cause of goiters. Iodine is added to other foods as well.